SwiftLock laminate flooring is a floor covering produced by the Armstrong corporation and sold at many home-improvement stores. It is designed to resemble traditional wood flooring, but costs a fraction of the price. This material uses a floating installation technique, which means it is installed without the use of nails or glue. Floating floors are considered much easier to install than other materials, and can usually be completed in just a few hours by DIY homeowners. Measure your floor to determine how much material you'll need to buy. Purchase about 5 percent more than you think you'll need, to account for material lost to cutting. Any extra material can be stored in the home and used for future repairs. Place all material in the home for 48 hours before installation to allow it to acclimate to temperature and humidity levels. Prepare your floor. Remove loose nails or staples from wood subfloors, and ensure all floorboards are secure. Grind away bumps or ridges on concrete, and use a leveling compound to fill holes or low spots. Use Armstrong foam underlayment to cover the entire floor surface. Lay the material out in rows, butting each sheet together without overlapping. Tape the seams together using duct tape, but do not fasten the underlayment to the subfloor. This material not only acts as a moisture barrier, but also makes the floor warmer and more comfortable underfoot. 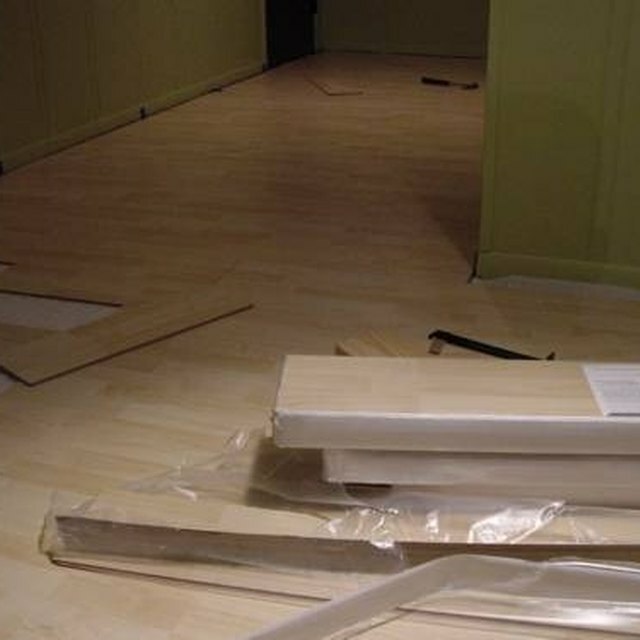 Start installing your first row of flooring along the longest or most visible wall in the room. Use spacers to create 1/4" expansion gap between the wall and the flooring. This will allow the material to expand and contract over time without cracking or bowing. Connect the second row of laminate. Hold each board at a 45-degree angle and line up the tongue-and-groove connectors. Slide the tongue into the adjacent groove and firmly press them together until the boards are connected and lying flat. Stagger the joints along each row by six inches to create a more stable and secure installation. Cut the boards as necessary using a circular saw or hand saw. To minimize damage to the surface, cut face down if using a power saw and face up if using a hand saw. Throw away lengths of material shorter than 12 inches. They tend to make the floor less secure, and can also make the finished surface appear unattractive. Use a pry bar to force the last row of flooring into place, making sure to maintain a 1/4" expansion space along the wall. Remove spacers and add floor boards or trim to cover the expansion gaps and complete the project. SwiftLock laminate can be installed over almost any type of subfloor, including wood, concrete, vinyl or tiles. It can also be installed over carpet as long as the pile is less than 1/4 inch. This material should not be installed over existing floating floor systems. When installing laminate in a bathroom, add a bead of laminate flooring adhesive to the tongue of each board as you work. This will minimize moisture penetration and extend the life of the floor.